We last saw Mercenary Kings inside Sony's PlayStation booth at E3 2013. The Kickstarted game piqued our interest earlier in the year, but getting hands on with the actual game enticed us even further. The game combines elements of Metal Slug style games with that of Metroidvania to make for an addictive 4 player co-op title. We were playing with Tribute Games' Jean Francois Major, who suggested we split up to locate the boss. The three of us went in different directions. The split screen gives local players the same freedoms of online play, allowing us to strike out on our own. I soon found the mech boss (it reminded me of the battle suits from Avatar). I dished out some damage, but it retreated after a few minutes, only to respond elsewhere in the level. The mini-map showed its new position and we made a mad dash toward our prey, quickly dispatching the grunts who got in our way. Tribute Games, who developed Scott Pilgrim vs the World, are releasing Mercenary Kings on Steam early access on July 22nd for $15. The normal price for the game is $20 so this will save you 25%. 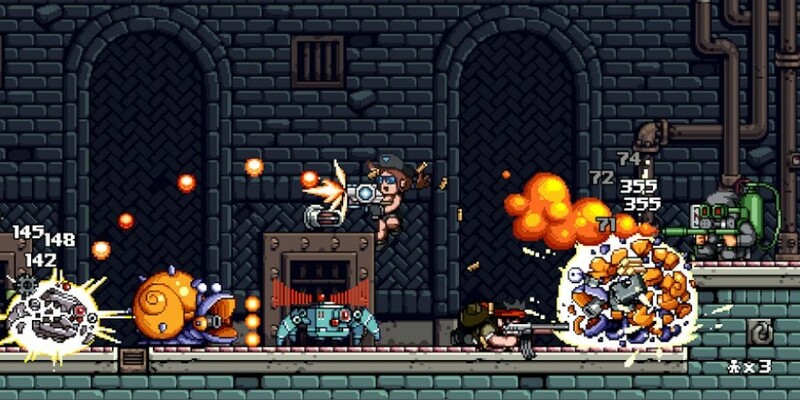 Besides the PC version, Mercenary Kings is set to release on the PlayStation 4 and the Ouya later this year. The latest trailer for the game shows the slick art style in motion.